It can be easy getting caught just swimming/biking/running when training for triathlons. But lifting, core work, and drills (among other things) are still really important in making an all around good athlete. On Monday's before our evening Master's practice Marty has been meeting some athletes at a local park for a run and all sorts of plyometrics and drills. I went for the first time last night because I had been resting that pesky hip (which has been feeling a-okay recently). 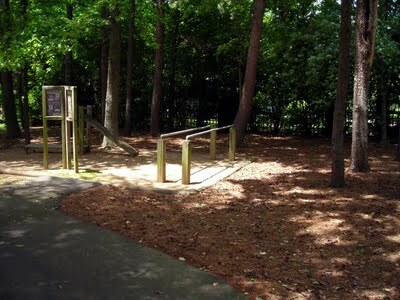 Bond Park has one of those fitness trails that meanders through it - you know what I'm talking about - those stations where you do everything from pull ups to jumping jacks. We run to each station and do whatever it is we're supposed to do (even if the thing you can only do consists of a whole two pull-ups, ahem). Some of it seems silly but most of it is really good to do to supplement the training. At the end we do run specific drills and strides. The entire run doesn't end up being all that long (2+ miles or so?) but with everything in between....holy crap am I sore today! PS Yes! I love my core/TRX sessions each week...much needed for sure! the core work is definitely making a difference with me...and tonight, hot yoga! hurray for cross training. In order to enhance my physical capacities when working out I am taking Military Grade Supplements. What I really like about them is that they are natural and provide sustainable results. Pre-workout formulas effectively enhance and maintain my endurance and strength. My reps are increasing and my shape improving steadily.